Photo by Peter Spurrier. Mara Keggi Ford in the 1986 U.S. coxed four. Olympic rower. Club and collegiate coach. Olympics competition manager. Sports marketer. Foundation manager. Fundraiser. 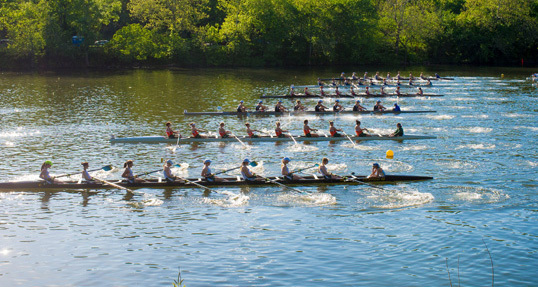 Mara Keggi Ford has seen the rowing world from just about every angle. A member of the National Rowing Foundation since 2009, the newly appointed acting executive director of the NRF is ready to lead the effort to support rowers who represent the U.S. on the world stage. It’s a population she knows quite well. After a collegiate career at the University of Wisconsin, she made the U.S. national team and was a finalist in the women’s coxed four at the 1986 world championships and in the pair at the 1988 Olympics in Seoul, South Korea. Later, while finishing her MBA at Emory University in Atlanta, Ford became competition manager for rowing as part of the host committee for the 1996 Games. “What motivates me the most with everything I do for the NRF and for USRowing is trying to give the athletes what they need to be the best that they can be,” she said. Ford began doing development work part-time for the NRF in 2009 and was named associate director in 2013. She worked closely with retiring director Charlie Hamlin, under whose five years of leadership the foundation raised nearly $6.5 million. Fundraising can be a challenging task, but Ford has already been part of effective solutions. “When I started at the NRF we had about 400 donors, and now we have over 2,000 and that’s a pretty significant shift in nine years,” she said.